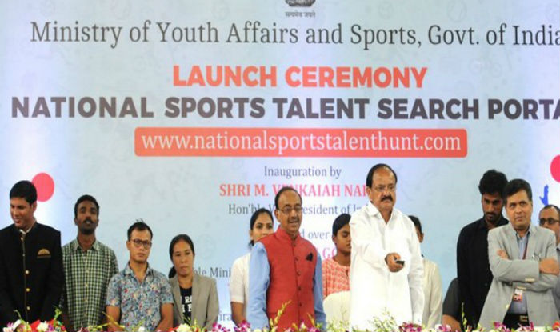 Ministry of Youth Affairs and sports has launched Sports Talent Search Portal to spot the best talent from among the young population of the country. The portal was launched by the Vice President of India Shri M. Venkaiah Naidu at a function at the Indira Gandhi Stadium in New Delhi. Minister of State (I/C) for Youth Affairs and Sports Shri Vijay Goel, Secretary Sports Shri Injeti Srinivas, Khel Ratna and Arjuna awardees sports persons and thousands of school children were present on the occasion to witness the path breaking initiative in the field of sports. School children presented a series of cultural performances on the occasion. Speaking on the occasion Shri Venkaiah Naidu said that this kind of initiative will not only help in identifying the best talent, but will also provide a level playing field to all the applicants and create a competitive environment. He said sport is an integral part of nation-building process, as it plays an important role in terms of individual development, community development, social inclusiveness and economic development. One of the most important factors that enable a nation to become a sporting power is the identification and development of right talent. As one-seventh of humanity, there is no dearth of talent in our country, especially with more than 450 million youth. Shri Naidu said, in fact, we are overflowing with talent, but in order to harness it we have to put in place a robust system to spot and nurture talent, and develop world champions. He said, the platform of National Sports Talent Search Portal will be a game changer and enable the Ministry of Youth Affairs and Sports and Sports Authority of India select the best. congratulating Shri Vijay Goel for the major initiative, the Vice President said, it will go a long way in attracting the best available sporting talent in the country. He said, this platform will be fast, transparent and provide a mechanism for fair selection. Shri Vijay Goel in his speech said the government is committed for the overall development of sports and sportspersons. He said under the guidance of Prime Minister Shri Narendra Modi policies are being framed to provide sportspersons friendly atmosphere in the country. Referring to PM’s address through ‘Mann Ki Baat’ on 27 August, 2017, shri Goel said, our beloved Prime Minister himself took personal interest in the portal so that budding and hidden talent should take advantage and come forward to hone their skills further to bring laurels to the country in future. He said, Indian players are continuously in the lime light in different sports in the world sports arena and referred to the recently concluded World Badminton Championship at Glasgow where Saina Nehwal and PV Sindhu won bronze and silver medals respectively by their hard work, talent and discipline. Shri Goel said, players are doing their best; and now it is the duty and responsibility of the Sports federations to perform in a manner so that best results can be produced by the talented boys and girls in their respective disciplines. Any person interested in registration on the portal can visit www.nationalsportstalenthunt.com Or www.nationalsportstalenthunt.in by following the registration procedure to upload their achievements and videos etc.